A premier facility for driver safety. 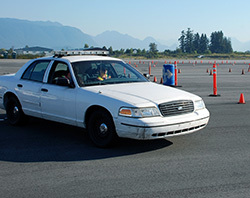 The JIBC Pitt Meadows campus situated midway between Vancouver and Abbotsford is designed for the purpose of event rentals and driver training. It includes 500,000 square feet of unobstructed, paved surface, a custom-designed off-road course and an indoor meeting/classroom space. Auto Manufacturers/Dealers – a safe space for vehicle testing, media events, demonstrations and customer events. Research & Development – a controlled environment to test and develop automotive products or safety features. Consumer Events – a large expanse of unobstructed pavement and a meeting room, perfect for product demonstrations and exhibitions. TV, Movie, or Commercial Shoots – an open, unobstructed space for staging and filming. Driver Education Centre's (DEC) professional driving instructors are available to train your employees or team members. The Pitt Meadow campus provides a safe and controlled environment where students can improve driving skills without external distractions or dangers. Our team of experts have years of experience in the driver training industry. DEC will customize driver training from basic to advanced techniques in order to provide students with the skills they need to become safer, more competent drivers.